Statwolf’s analysis capabilities are its core strength. Our Data Integration Engine brings together business data across your entire technology stack, giving you the speed and flexibility you need to manage and create real-time analytics of any kind, while the simple interface means anyone in your organisation can use it. Businesses change all the time, so Statwolf is designed to be flexible. The first of its kind, the architecture of the platform combines the intelligence of machine learning with an infinitely scalable analytics layer, and hybrid columnar storage. 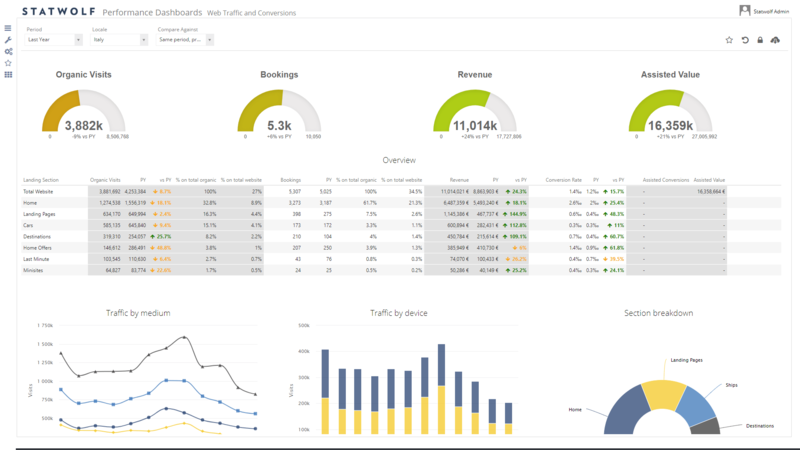 Create as many dashboards as your team needs. Query complexity, simplified. Intelligent query generation that allows anyone to analyse unstructured data using Natural Language Processing with 100% accuracy. 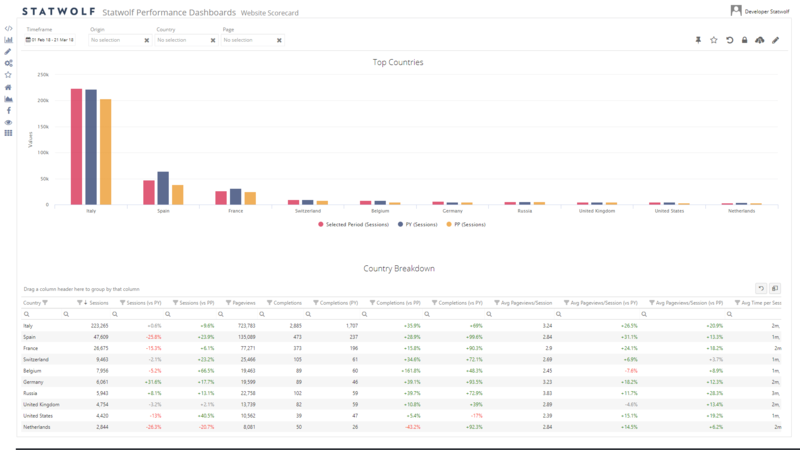 Conduct analysis with filtering, aggregations, trend analysis, pivots and visualise them in a variety of ways. 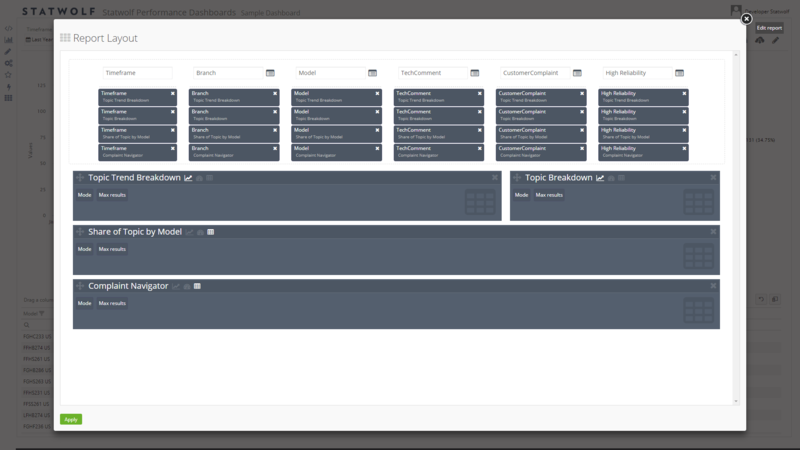 Select your preferred analysis methodology, customise your filtering options and build your layout's graphics. 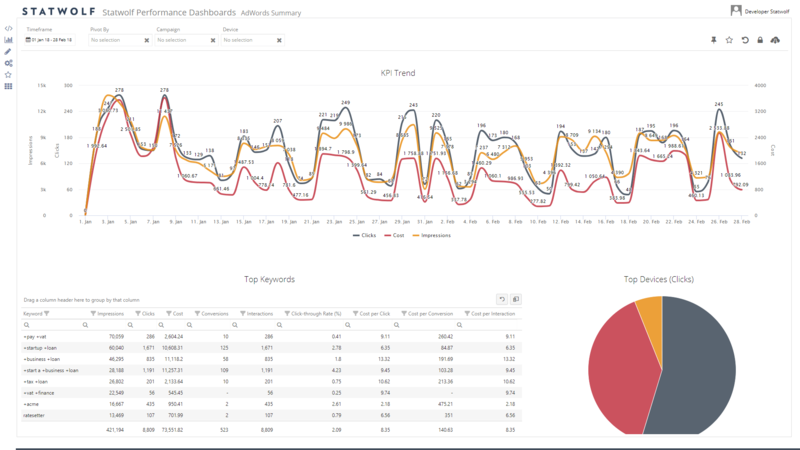 Save your dashboard in your menu, or make it available to the entire team. Add and manage as many standard data sources as you want. Develop unique queries in SQL for even greater control over your advanced analytics. Manage your non-standard data flows by creating datasets from different data sources, and get them to work together. Securely share your data and reports while maintaining your organisational governance policies. Define user groups, manage data access permission and oversee data sharing options. Integrate your own data with our APIs in complete autonomy. Access your data from any external tool of your choice by making your queries with SQL. No API needed! Deploy a dedicated Statwolf platform to maximise your data analytics capabilities. You can request your backed up data, any time you need it. Run various types of exploratory analysis on your data (e.g. distribution, correlation, PCA), share the results and gain a deep understanding of the actionable insights hidden within it. Manage your machine learning data flow in the production environment, which includes pre-processing, cleaning, normalisation, dimensionality reduction and algorithm updates. Select, setup and train a wide range of machine learning algorithms. Keep track of their performance to improve and reproduce the results. ISO 27001, HIPAA and HITECH compliant hosting partner: Microsoft Azure. 24/7 network monitoring & network-based intrusion detection system (IDS). Full encryption applied to all uploaded and downloaded data. Data centre accreditation under international and industry-specific compliance standards, including FedRAMP, SOC 1 and SOC 2, along with country-specific standards like Australia IRAP, UK G-Cloud, and Singapore MTCS. Statwolf's Digital Marketing solutions help us create added value, backing up our cutting-edge strategies and campaigns with results. TSW is a bustling Italian digital agency who design 'human experience'. With a long roster of corporate clients to manage, TSW were struggling to make data-driven decisions. 90 percent of staff time was dedicated to extracting and analysing data - which left little time for acting on their insights. In a nutshell: TSW needed to better organise its data. TSW integrated all its data sources into Stawolf's platform. Using Statwolf's Advanced Analytics Toolbox, the TSW analysts could create new analysis in total autonomy. TSW saw a 100 percent reduction in time dedicated to data extraction and analysis. Furthermore, the team saw an 80 percent reduction in the time dedicated to preparing reports for clients. TSW now dedicate this ‘extra' time to clients' strategy development, analysis design, and business development activities. Roland DG is a global leader in digital technology who recently started digital marketing activities. Statwolf’s marketing is now a crutch to how they market in the EMEA. Roland DG is a global leader in digital technology. It recently started digital marketing activities to reinforce its inbound strategy and to attract ready-to-buy leads. Statwolf created a platform for the B2B giant to integrate all the data within Roland DG’s EMEA CRM. The solution was tailor-made to support Ronald DG’s ever-changing needs and to facilitate individual EMEA marketing managers to monitor their country’s performance across multiple channels. 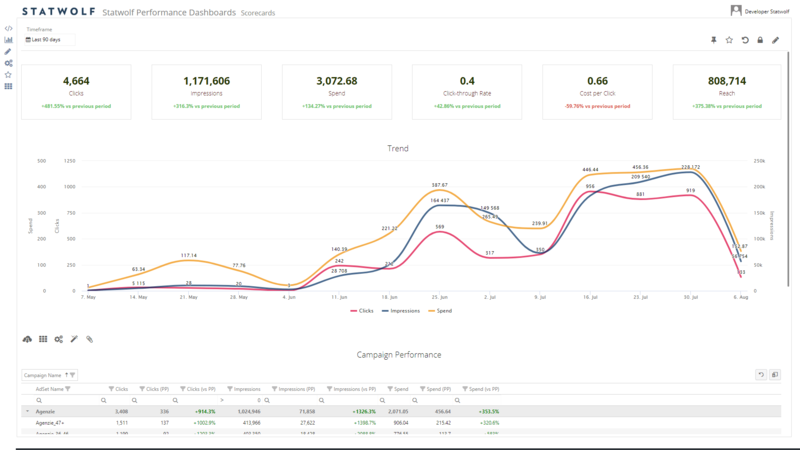 An intuitive solution, Statwolf is now at the backbone of Roland DG’s EMEA marketing activities, with data from the dashboard as the main asset for decision-making regarding digital marketing in the EMEA area.